Budapest is lively on Mondays, and there are lots of things to do and attractions to see even if many museums are closed on Monday. If you wish to find out about current things to do next Monday, please take a look at the Budapest Events Calendar. Read on to find out what you can do on Mondays in Budapest in general – whether it rains or shines. Mondays can be a bit of a headache to plan your itinerary if you love museums and you expected to see some nice exhibitions. Especially of the weather forecast was ruining your Budapest trip with a rainy Monday when the obvious option is to pick a few indoor attractions, i.e. beautiful sights with amazing interior, exciting things to do, etc. But you shouldn’t despair even on a rainy Monday in Budapest. Here’s why not, and some ideas to spend your Monday not only meaningfully but with pleasure – as on a long awaited holiday you would wish for. One of the most beautiful and well-known attractions in Budapest, the Hungarian Parliament is open on Mondays. You can have guided tours at the Parliament in multiple languages during the 1 hour (in fact, approx. 35 min tour, if you subtract the check-in time). All the famous thermal baths in Budapest are open on Mondays. If you have visited Szechenyi Bath, try another one. Seriously. All of them have a different character, just like two people are not the same. Some of the spa baths are from the 16th century, the Turkish Baths are unique in Budapest, while Gellert Bath is the most outstanding with its exquisite Art Nouveau interior, the colourful mosaics, the natural curves, etc. Some of the outstanding churches in Budapest, namely the Catholic St Stephen’s Basilica and the Jewish Dohany Street Synagogue are open on Mondays. Both have amazing interiors, and guided tours of various length and depth are available all year round. To boot, every Monday there is a short but fascinating organ concertwith singers at the St Stephen’s Basilica (Szent Istvan Bazilika) from 5 pm. The schedule of the Monday concerts may change so do check the actual concert schedule on the official site of the St Stephen Basilica. Matthias Church by the Fisherman’s Bastion is unmissable, and if you ventured to the Buda Castle District on the Castle Hill on a Monday, there is still a lot to see, even though the museums are closed (except for the Hospital in the Rock Museum, a cool museum showing what a former nuclear bunker and secret WW2 hospital looked like – under the hill!). Monday in Budapest can be a perfect day to enjoy some great music events, operas, jazz concerts, hiphop, swing, punk, D&B, metal, what have you. There are all sorts of music programme on Mondays in Budapest, you just need to ask around (the concierge, locals at the bars, students at the cafes, etc.). Some of them can be at certain festivals, like in the Vajdahunyad Castle the Vajdahunyad Summer Music Festival. Locals will be happy to help you to get a great idea about what to do on a Music Monday. If in doubt, ask for our tips in the comments below, please say which Monday exactly you are looking for activities. Palace of Arts (MUPA) – The Palace of Arts located between Petofi Bridge and Rakoczi Bridge in Budapest (closer to the latter) is an excellent place to listen to high standard classical music, jazz, world music concerts almost all year round (yes, unluckily, the summer holiday at MUPA means that there is a scarcity of events in July and August, much like in the Hungarian Opera House). On Tue, Wed and Thu, there are free concerts at the Palace of Arts (young talents perform), but no such free concerts on Mondays. Nevertheless, general entrance fees to some of the concerts are really good value for money. See the current events at the Palace of Arts here. A38 Music Club – The award winning A38 Club and Restaurant is a cool ship with cool concerts (underground, indie rock, electronic music, triphop, dub, world music, metal, punk, etc.). There are lots of music events all year round, even though summer means somewhat fewer concerts, but there are still lots of parties, in good weather roof parties on top of the standing ship (the whole club is on a former Ukrainian stone carrier ship). Sport Arena in Budapest is where the big, i.e. mega concerts take place with formidable singers and bands. Budapest Sport Arena will host a Sting or a Duran Duran or a Julio Iglesias concert, for instance. The venue is officially called Papp Laszlo Budapest Sportarena and here is the official events guide. Admittedly, there are very few events scheduled for Monday, still it is worth a click to find out for sure if you have anything on during your stay in Budapest. These are the top music venues currently in Budapest with the best local and foreign performances, but there are literally hundreds of music venues, like the warmly recommended Budapest Jazz Club, the city central Akvarium Club (former Godor Club) on Erzsebet Square, Mika Tivadar Mulato (a former factory turned into a hip bar), Cafe If (If Kavezo), Old Man’s Pub, etc. And of course you can always venture into the trendy and retro ‘ruin pubs‘ these cool underground and lively bars which make Budapest’s nightlife truly rich and unique. There is no shortage of DJs and Vjs for sure. 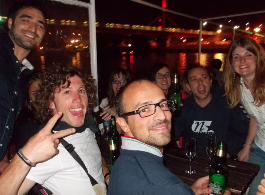 You can have fun at Karaoke parties in Budapest at several places, e.g. at Morrison’s Opera bar and at Morrison’s 2 on Szt Istvan korut street from 7 pm (free to enter). Likewise you can go to the Monday karaoke parties at Noiret in Dessewffy street at 8:30 pm (free to enter). You can schedule your market tours and (gift) shopping for Mondays in Budapest, when both the bigger and smaller market halls are open (although they may close earlier than you think, so do not schedule them after 4 pm, instead try to make them a Monday morning event in your Budapest itinerary). The nicer and more touristy market hall is the beautiful Great Market Hall aka Central Market Hall by the Liberty Bridge. Its 19th century architecture is truly amazing, so it is well worth a visit even if you don’t want to buy paprika, Tokaji aszu wine, Unicum, cans of foie gras or embroidered tablecloth, the usual souvenirs offered at the market stalls. Perhaps not so surprisingly, the market hall where many locals go shopping is the more affordable and architecturally not significant (unless in a pejorative sense) Lehel Market Hall. Its architecture is colourful and tasteless most locals think – it has a shape of a ship, but somehow the whole structure is gaudy. That said, Lehel Market Hall will show you great foods, fresh vegetables and yummy fruits: try some pickles, fresh fruits, locals wines, beers or spirits and – if you are not a vegetarian – some Hungarian sausages, etc. You will see a lot fewer tourists at Lehel Market Hall, and many Hungarians who belong to the less affluent class. We love our Budapest Zoo very much. It is a beautiful Art Nouveau zoo, although somewhat smallish, there are several nice and somehow nostalgic sections (Elephant House, Butterfly House, Seals, Petting Zoo, Japanese Garden, etc. ), and some architectural gems to see. The Budapest Zoo is close to the city centre (in the City Park, a 15 min ride with the lovely millennial metro, the yellow M1 underground from the city centre of Budapest). Families with kids can feel at ease as the Zoo is right near the Amusement Park and the National Circus (a permanent circus building with lots of traditional circus entertainments). Plus the affordable Bagolyvar Restaurant can be a quick lunch place right near the Zoo. Although Szechenyi Bath is also just a few steps, please bear in mind that thermal baths are not really recommended for children under 14. To be on the safe side, try swimming, splashing and generally enjoying waters at Palatinus lido or Dagaly lido if you visit Budapest with kids. Budapest is more exciting than our tiny list, so the above tips for your Monday in Budapest are just the tip of the iceberg, literally the most visited and popular places. There are a lot more things to do to cater for all interests and age groups, from contemporary dance performances (see Trafo for a sure bet), or folk dances (Budai Vigado, or the National Dance Theatre), river cruises, various tours in Budapest (Bus, Segway, Jewish, Bike, Art Nouveau, etc.) , family programmes, etc. There is always something going on even on Easter Monday and Whit Monday, which are both bank holidays in Budapest, but not party breaks. 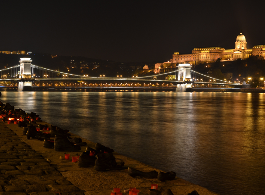 For further ideas, please check our Budapest Events Calendar.